My sabaton project rolls along. Some may notice that my patterns have changed, This is because once I actually starting working with the steel, my mind became flooded with all the possibilities and I chose to pursue them. Thus, the patterns that were once fairly simple have begun to take on the flavor of true medieval Gothic style. One of the first choices I made was to adopt a wavy pattern atop the individual lames. 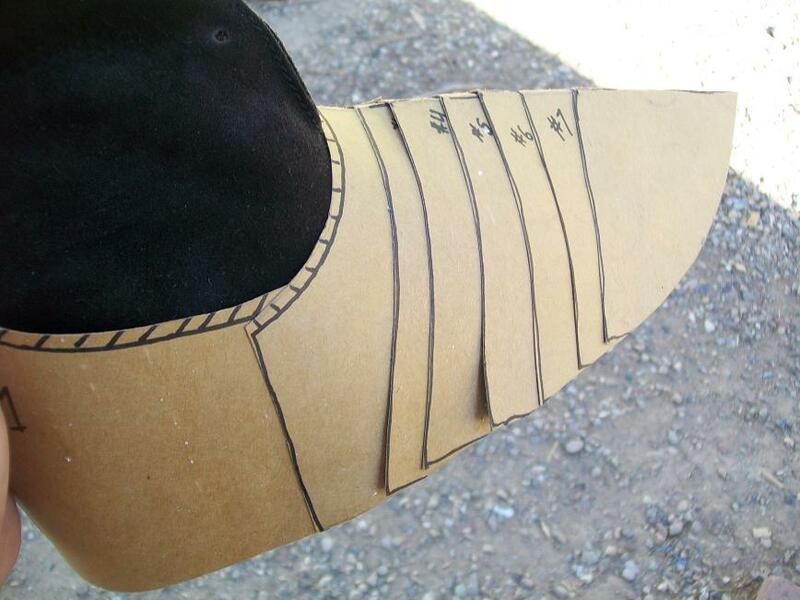 The second was what to do with the fluting (raised channel) — I decided that since this was my first attempt at armor that a single channel up the center was called for. Master William the Sinister has been dedicating his time in assisting me, to which I’m very grateful. An experienced armorer at your side is surely more of an impact than the most precise hammer at the anvil. The next step is cleaning up the plates so I can focus on assembly. I’ll be using brass rivets to attach each of the individual pieces, with the exception of the heel which gets attached via leather (or perhaps hinge?). I’m very pleased with the project so far (especially since I have spent $0.00 *laughs*). I look forward to posting the finished project this Friday. With mighty Pennsic just over the horizon, it’s time to buckle down and get some of my own projects done. 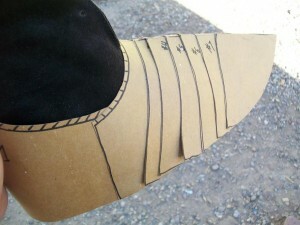 First on my list is constructing a pair of medieval sabatons — I thought that they would be the perfect solution for not yet having historically accurate footwear and not wanting to show it! The sabotons shall, of course, be designed around German sabatons of the 15th century in shape, style and application of materials. 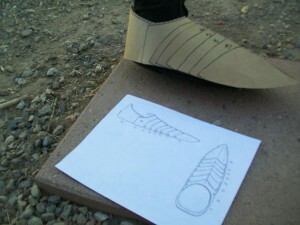 However, I’ve never attempted to craft plate armor of any sort let alone a pair of curvacious and articulating plates shoes. Can I do it? 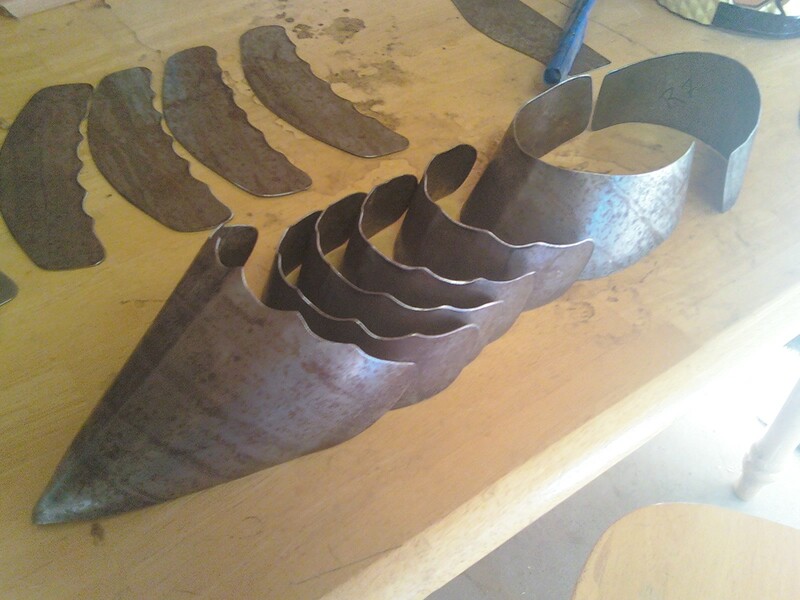 Well, after seeing the great challenge that was the making of good period armor, and knowing of the vast quantity of modern tools and materials we now have at our disposal, I better be up to the challenge! I shall be working closely with two shire brothers of mine — an experienced armorer, Master William the Sinister, and my good friend, Charles von Strausberg. I don’t want to cut any corners on this project and plan on using materials and tools as close as true to the period as possible: 16 ga. mild steel, quality leather, steel (or brass?) rivets and the like. I have always liked the fully inclosing construction of the sabaton (except the bottom of course) and plan on doing the same. I started reading on just what exactly the armorer was looking for when they built the sabaton and just what sort of styles would have been correct. Lots to learn it seems. 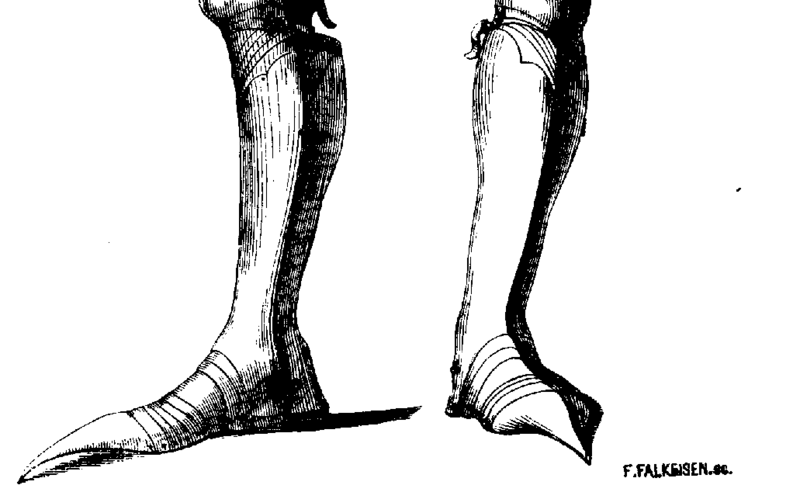 Amusingly, it turns out that the pointed toe sabatons of the 1300s and 1400s could be as long as 24″, but that the maximum length allowed actually was dependent on the rank of the wearer. As a combatant in the SCA, the concept of a long (absurdly long) toe would only get in the way and could be a potential safety risk to my fellow fighters. 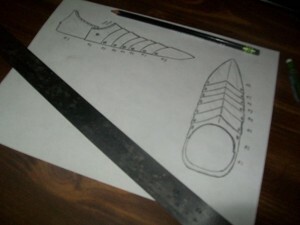 Thus I shall be adopting an modestly pointed toe for this particular project. 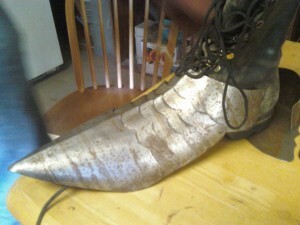 I choose to design sabatons that enclose the foot but that aren’t permanently attached to the boot. The concept of being able to change out footwear on a per event basis is quite appealing to me, to be honest. I also wanted to reinforce the gothic style of armor by running a fluted channel down the center to the toe. After some simple sketches I choose to make a scale mock-up using cardboard. I ended up with a functional (and fitting!) design that ended up consisting of 8 overlapping components. I envisioned a belt and buckle design that will allow me to fasten the heel plate to the rest of the sabaton for reasons of convenience (not shown). So far I’m happy with the design, but its only cardboard — I’m looking foreword to seeing how well such a thing could be crafted in steel. I’m still working on exactly how I want to attach the sabaton under the boot under. I’ve gone through a number of ideas, both modern and medieval, but have elected to take it step by step. I found it interesting that I choose to design functionality before historical accuracy but still ended up with a similar design in the end (imagine that!). For me first foray into armorworking, I’m seriously enjoying this.